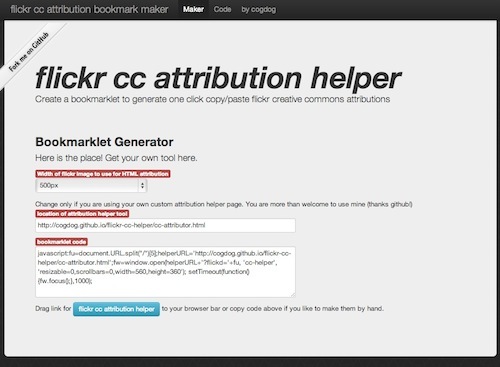 Flickr CC Attribution Helper originally was a browser script that adds content to any flickr page for photos that are shared under creative commons licenses. It provided two different cut and past attribution texts. The first is designed for blogs and includes the flickr URL to embed the image; the second a text string suitable for adding to presentations or other media. As of March 25, 2014 flickr’s switchover to their new design rendered my scripts useless. Who need’s em? I’ve just created a new tool that does the same thing, but via a Bookmarklet tool, the new, shiny Flickr CC Attribution Helper. The default settings should be okay; you may want a wider than 500px image (note that it will fail if the original uploaded image is smaller than the size you select). Make sure your web browser bookmarks bar is visible. Click, drag the link text from the blue button, and drop it onto your bookmarks bar. Now use your favorite flickr search tool to find the display page for a creative commons licensed image. Click the “flickr cc helper” link on your tool bar…. and look! As a bonus, this should work in any web browser (well, IE is always a random chance of anything working). Photos For Class find cc licensed images and download a version with attribution added directly to the image. I wish I had looked at this earlier. The format was not what I wanted. 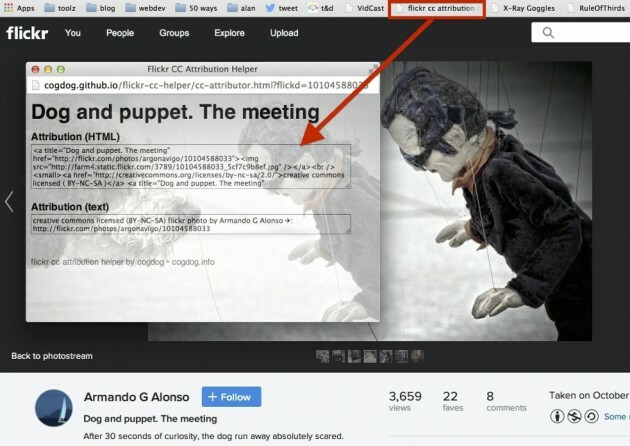 So I created my own attributor file using the slide-attributor.html as the template. This is useful. Thank you!